Martedì 12 e mercoledì 13 febbraio verrà presentato l’ultimo lavoro di Armando Lulaj, prodotto da Paolo Maria Deanesi Gallery, al 63° Film Festival di Berlino (Berlinale) – Forum Expanded. Dopo 44 anni dalla sua prima realizzazione gli abitanti di Berat, cittadina a sud di Tirana (Albania), oggi non vedono più la grande scritta con il nome del dittatore ENVER sulla montagna che sovrasta la città, bensi NEVER un nuovo monito alla libertà che provoca le coscienze. During Communism in 1968, by order of the Labour Party the army helped by the voluntary youth undertakes one of the greatest voluntary works of the Communism system in the particular Shpirag mountain that faced the antique city of Berat. To finalize the result of this forced manual work, military airplanes of the Communism period had flied aloft following a parallel course close to the mountain side on which has been designed with rocks and paint with white colour the largest letters that form the dictator’sname “ENVER”. On the same mountain, exactly on the same side, but 44 years later, time has erased the dictator’s name and the surface is fulfilled with bushes and plants. Some old mans, those who helped in 1968, and a young boy, pushed by their free will, equipped with old topographic tools, same as those used during Communism, climbs the mountain and starts to measure the surface and compute distances. Few in number but familiar with the ground, sure to archive their intention, they extirpate the bushes and plants, drive in pillars to then unite the sizes measured with cords. One of them ties in his body a primitive Chainise disinfestation pomp, now fulled with white colour and starts painting the marked surfaces. He works day and night to fulfill this undertake same as 44 years ago, but with a completely different meaning to archive. 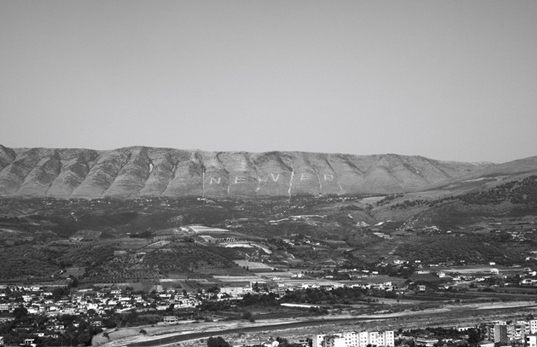 Finally, when work is done, by changing the place of the first two letters, he has overwrite on the same mountain side, above the same positions, above the same name, a bigger word more symbolic that the dictator’s name, the word “NEVER”.